The nursing job market should continue to grow in the future, but a large number of students are also pursuing professional training for this field. Nursing students are likely to share many credentials, with the exception of areas of specialization. Your resume should indicate your qualifications for a position in ways that make a strong case for your merits. Our nursing student resume templates and writing advice can give you the edge you need to stand out and succeed. Read on to discover how templates can work for you, learn about several suitable formats for nursing students, and find out what to include in each of the major sections of your resume. 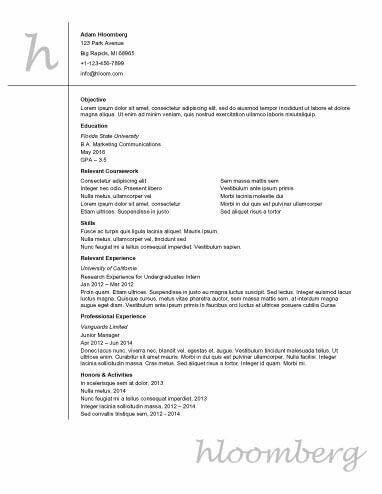 Why Use Nursing Student Resume Templates? Templates make it easy to experiment with professional presentation. There are several styles that could be ideal for nursing students. On the other hand, if you are a nursing student with a relevant work history, you might be ready to show off your achievements and experience using one of our professional nursing student resume templates. These templates provide a balanced format for covering aspects of your experience beyond your formal training, including a full work experience section. If you want your resume to be up to date and meet or exceed the expectations of today’s employers, you should browse through our collection of popular nursing student resume templates. These templates are frequently used because they enable jobseekers to present the information employers most often look for in attractive and easy-to-read formats. You may need to prepare a resume when applying for an internship. Our internship nursing student resume templates can help you launch your career. Learn how to present your education and training to impress employers and gain valuable work experience that can help you land a great position once you have completed your degree and become certified. If you are wrapping up your education, you might be ready to write a resume for a nursing position. Even if you don’t have much on-the-job experience, you are likely to have accomplishments, cutting-edge training, and extracurricular involvements that can help you get the job you want if you present them in an informative and structured entry-level resume. Even if you are lacking significant work experience, providing a resume that covers your past education and anticipates further training can help to convince hiring managers that you would be an asset. Look over our graduate resume templates to see how to address your experience and present your professional background while pursuing higher learning. Each major section of your resume should contain information that an employer or academic committee will find useful. Try to limit the content of this document to the most necessary details. You can bring up any additional background in a cover letter or other application materials, or during an interview. The type of statement you use to open your resume will give employers a sense of your intentions and perspective. Note the type of statement offered in any nursing student resume templates you consider using. Summary Statement: This newer method of opening a resume consists of a few brief phrases that should resonate with the description of the position you are seeking. A summary statement focuses on your qualifications and what you would bring to a position. Objective Statement: A traditional resume opening is a statement of intent. You declare your interest in an available position or your professional goals. An objective statement may be desirable for certain types of applications, including entry-level positions, internships, and academic opportunities. Professional Credentials: Include certifications and licenses in the education section as well as the date you obtained these credentials.